Home » Our Doctors » Opal Amin, O.D. 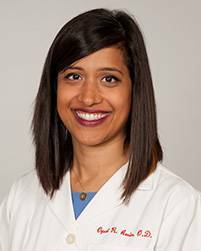 Optometrist, Dr. Opal Amin, is a graduate of the University of Texas at Austin. She completed her optometric studies along with her Optometric Glaucoma Specialty at the University of Houston College of Optometry, and she continued on to complete a residency in Cornea and Specialty Contact Lenses at the University of Houston. In 2010, she went on to become a Fellow of the American Academy of Optometry. Opal is very happy to be back in Austin practicing. When not in the office, she enjoys music, the outdoors and traveling with her husband, Ishan.